We recently spent some time exploring the FOG Design + Art fair and were amazed by what we saw. Lasting from January 13th to January 17th at San Francisco’s Fort Mason Festival Pavilion, the fair kicked off with a special preview gala benefitting the new SFMOMA that just opened this May. In a night filled with exquisite culinary creations, cocktails, and music, we were able to get a first glimpse at the presentations of the 43 dealers and galleries that showed off their most unique works. Follow us as we take you through the five top themes that we found most inspiring. 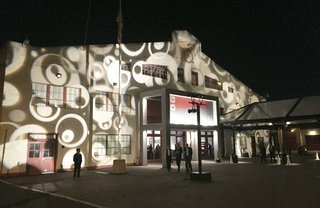 On the night of the special preview gala at the Fort Mason Festival Pavilion, we found ourselves entering an illuminated facade, leading into somewhat of a dream space. Once inside the spacious pavilion, it became clear that the fair would be a living example of how the lines between art and design can be blurred. Whether it’s a sculpture, a piece of furniture, or a mixed media creation, the pieces are meant to be lived with and were created with the goal of becoming part of our daily lives. One of the first things that jumped out at us was all of the incredible vintage pieces that galleries from across the country were showing off. Intentionally mixed in with both new and one-of-a-kind items, these timeless pieces perfectly fit in the mix while still upholding the eras they came from. Presented by NYC-based showroom R & Company, a bright yellow geometric dining table was one of the first pieces to catch our eye. 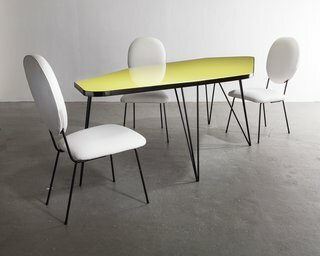 Designed by Brazilian modernist Joaquim Tenreiro in 1958, the bottom of the six-sided glass top is painted with a bold yellow hue. Supported by black iron legs, the form of the table was created with a jacaranda frame, a natural wood material that’s often seen in Brazilian furniture design. Known as one of the pioneers of modernist Brazilian furniture making, Tenreiro was vital in creating a new formal language for 20th-century Brazilian furniture design and was one of the first of his peers to use repurposed raw materials. Also shown with Joaquim Tenreiro’s edgy dining table, was a set of 1960s dining chairs with white leather upholstery and painted iron frames. 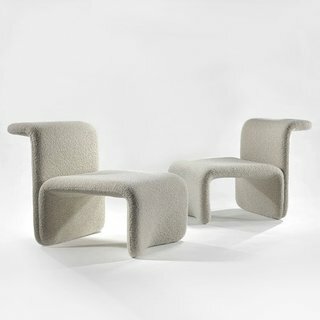 Based in New York and focusing on the intersection of design, art, and architecture, Demisch Danant gallery showed off their collection of works by the iconic French designer, Pierre Paulin. As one of the most influential designers of the 20th century, Paulin’s quirky and memorable work lived closely in line with the cultural times of the ‘60s. One of the pieces displayed at the fair was his Mushroom Sofa, a close relative to his notorious Mushroom Chair. 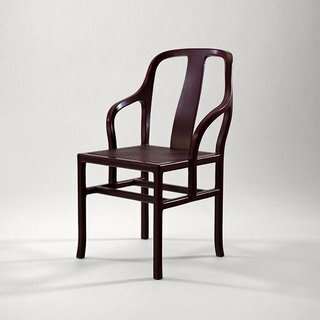 Also featured in a rich eggplant tone, was his limited edition Chaise à Palmette chair, manufactured by Ségransan in 1981. 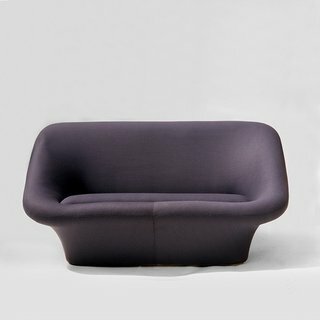 Designed in the 1960s and covered in a purple stretch jersey fabric, Paulin’s Mushroom Sofa was a perfect representation of his charming style. Also exhibited was his Chaise à Palmette, beautifully constructed of lacquered wood and a cane seat. Also featured in Demisch Danant’s presentation, was a pair of graphic and surprisingly buoyant chairs designed by Michael Boyer in 1968. Boyer was known for designing prestigious offices, hotels, and banks, often utilizing interesting architectural shapes in his work. These chairs do just that, with an emphasis on the beauty of empty space. Throughout the fair, we spotted a few examples of creations based around an interesting and playful utilization of shapes, one being the Joaquim Tenreiro dining table as previously discussed. 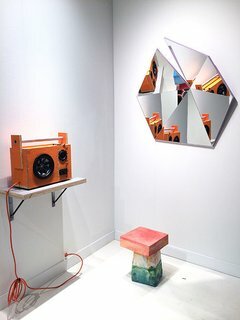 However, our favorite contemporary example of this was the Identity Check kaleidoscope mirror series by David Fox and Chris Stone of Stonefox Architects. 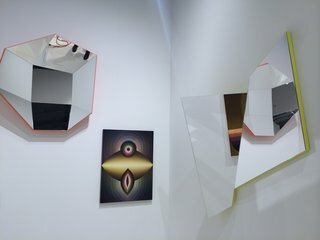 Part of Salon 94’s curation, the 3D nature of the sharply jointed mirrors reflected multiple angles throughout the space, creating a psychedelic effect. The partners behind the architectural firm prove how the collision of art, product design, and architecture can have explosive results. Stonefox Architect’s mirror series includes five different faceted shapes in five high-gloss colors. Each mirror started with flat pieces that were fit together like a puzzle. Standing below the mirror, is Kueng Caputo’s Sand Chair, formed out of Styrofoam, mortar, sand, and bright-colored pigment pastes. Also shown here is Tom Sachs's Mythologies, a mixed media art piece that mimics a speaker—and actually works. Though artists and designers often turn towards nature for inspiration, it’s not everyday that the results are strikingly literal. Case in point, acclaimed architect Zaha Hadid’s Liquid Glacial series is directly influenced by the natural movement and formation of ice. Shown by the London-based David Gill Gallery, the collection includes tables, chairs, and stools, all formed from acrylic that’s milled and hand polished to perfection. 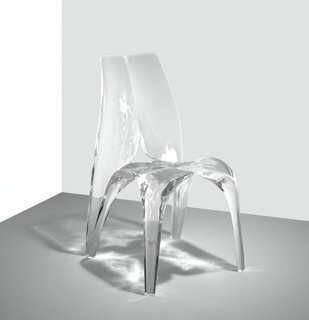 Zaha Hadid’s Liquid Glacial dining table and chair are crafted with acrylic that’s been manipulated to look like suspended pieces of formed ice. 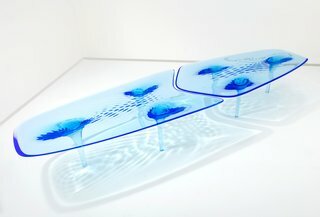 The waves and ripples turn these furniture pieces into fluid art forms, seemingly frozen in time. Also referencing the unique surface of a natural material, was Alex Rasmussen’s Lunar Console Table, presented by Edward Cella Art & Architecture. This mysterious console made entirely of anodized aluminum, is one of Rasmussen’s limited edition functional works where he has experimented with manufacturing processes to create innovative aluminum textures. Inspired by the experimental blue works of French post-war artist Yves Klein, Rasmussen manipulated a satellite image of the moon to create a loose interpretation of its surface. In order to keep it from feeling too literal, he used a high-tech digital program that took a compressed version of the image and converted it into a texture that was then applied to the surface. Throughout the fair, we couldn’t help notice the endless personality that radiated from each and every booth. Some more serious than others, a large amount of work stood out to us as being clever and playful. 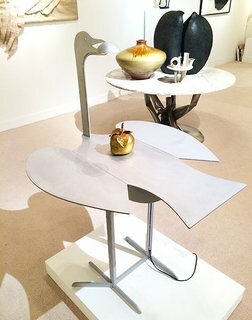 At the presentation of San Francisco-based gallery Lebreton, we spotted this brushed-aluminum bird table by Francois-Xavier Lalanne, titled Oiseau d'Argent. Take a closer look and you’ll notice that the wings fold down and the beak works as a light. Now, that’s what we call a conversation starter. We were excited to see such a fun piece by Lalanne. The late French artist was known for creating a whole world of surrealistic animal sculptures that often doubled as utilitarian pieces. Though the next find is quite different from the Lalanne piece, they both take cues from animal forms and brought smiles to our faces. Available at R & Company, Renate Müller’s Therapeutic Toy Magic Horses are part sculptures, part toys, part therapeutic tools. Based out of Germany, Müller creates these beauties with the goal of helping mentally and physically handicapped children develop their balance, coordination, and senses. 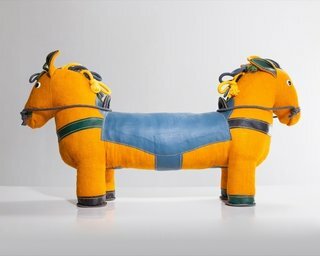 The Double-Face Pony version of Renate Müller’s line of therapeutic horses, is carefully produced out of jute and leather. These cheerful tools have actually been tested in various hospitals and clinics throughout Germany, with continuously positive results. Photo by Joe Kramm/R & Company. The final trend that radiated throughout the space was a clear focus on woodworking and how the art form has developed over the years. Part of an agenda of intriguing talks and films, the teams at FOG and Reform Gallery put together a panel discussion about how the craft has been engraved into California's creative scene. 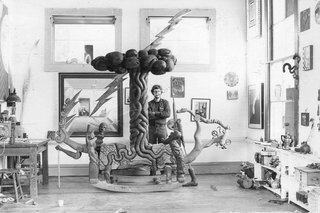 Titled, Visionary Wood: Northern California’s Woodworking Renaissance, 1970-1979, it took a personal look into the artistic landscape of the time and how local craftsmen embarked on a journey that was deeply influenced by a developing radical culture. Sculptors including J. B. Blunk, Robert Strini, and John Bauer, were suddenly free to explore their art form in the way they saw fit, rather than being held down by cultural expectations. J.B. Blunk’s first real masterpiece was his own home he built in Inverness, California. He hand-carved intricate details throughout the home, where it fit harmoniously with its natural surroundings. We learned that he would often find a tree he admired in his backyard and turn it into a sculpture without removing it from the ground. Shown here is his sink he carved by hand with a chainsaw and chisel, his chosen tools of the trade. Photo by Kodiak Greenwood, courtesy of Reform Gallery. The panelists included Strini, Bauer, Gerard O’Brien of Reform Gallery, René de Guzman from the Oakland Museum of California, and Mariah Nielson, Blunk’s daughter and curator of his estate. Nielson thoughtfully explained how the '70s was a freeing time for artists like her father, when they were no longer pressured to fit into set categories as artists. 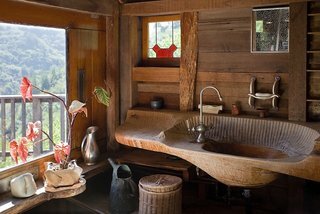 As to be expected, the work of these craftsmen lived closely in line with the natural landscape of California, and has become a cherished part of the local history. This fairytale sculpture created by John Bauer in the ‘70s rocked with multiple moving parts. This eccentric piece was debuted onstage at a concert by The Youngbloods at San Francisco’s Avalon Ballroom. It’s a perfect example of how imaginations were set free at that time. Photo courtesy of John Bauer.